Zuhdi Jasser: "Trying to suppress what can be painful speech about Islam at society's fringes will actually paradoxically feed an unintended consequence of fomenting non-Muslim fears of Islam." 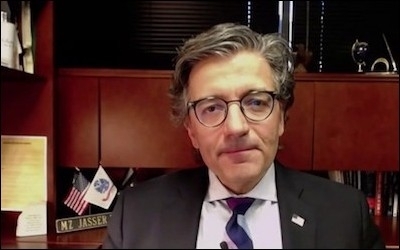 Dr. Zuhdi Jasser is a former U.S. Navy Lt. Cmdr., and since 9/11, one of the few obstacles in the path of the international Islamism in North America that is led by admirers of the radical Muslim Brotherhood of the Arab World and the Jamaat-e-Islami in the Indian subcontinent. On Monday, Dr. Jasser, who heads the American Islamic Forum for Democracy (AIFD), appeared before the Heritage Committee of the House of Commons to share his views on the supposed anti-Islamophobia Motion 103 tabled by Liberal MP Iqra Khalid. Jasser told the Canadian MPs, "I am here to tell you that by simply even using that term and referring to it as 'Islamophobia' and getting the government into the business of monitoring any form of speech will end up paradoxically heightening societal divisions." "Trying to suppress what can be painful speech about Islam at society's fringes will actually paradoxically feed an unintended consequence of fomenting non-Muslim fears of Islam," he added. He warned that non-Muslim Canadians and Americans "who cannot have their real fears heard and their speech exercised will be stifled from the public sector and push resentment underground where it will only foment." Trying to suppress 'Islamophobia' only 'foments non-Muslim fears of Islam,' according to Jasser. Jasser requested Canadian politicians and opinion leaders "stop engaging [with] Muslim Brotherhood legacy groups in government and media and recognize their misogynist, anti-Semitic, homophobic, and anti-American ideological underpinnings." The AIFD chair pressed Canadian MPs to make sure they understood that the advice they received "from ideological Islamists is compromised by their fealty to [Islamic] clerics, and the tribal construct of Islamic states from Muslim majority nations." He could have added that leaders of some Islamic sects live outside Canada, yet determine what their followers do or say, even in legislatures. Most presenters at the hearings get a chance to answer questions from MPs on both sides of the house. But as I experienced myself, along with other Muslim opponents of M103, such as columnist Farzana Hassan and activist Raheel Raza, the Liberals and the NDP use this time to attack us or simply refuse to engage with us. Jasser's presentation was no exception. Despite taking time out of his schedule and speaking from Phoenix, Arizona, he ended up being scolded and mocked by Liberal MP Arif Virani who used his designated seven minutes berating the American guest and running out the clock, leaving little time for Jasser to respond. Committee chair Hedy Fry and Liberal MP Arif Virani seem to have a well-coordinated plan on how to humiliate Muslims who do not fit their stereotype of who we are. What happened when I testified was Fry allowed Virani to stage an attack on me right at the end and then when it came time for me to respond, Fry said, "Sorry, time is up." This time David Anderson, a Conservative MP from Saskatchewan, would not have it any more. He approached Fry: "I am bit concerned and I don't know if Mr. Virani is deliberately doing this, but it amounts to bullying witnesses by using his time to lecture them when they have come here at their time and effort." Fry relented and gave Jasser one minute to respond, before cutting him off mid-sentence. Monday also saw Balpreet Singh, representative of the World Sikh Organisation (WSO) claim that "opposition to M103 was based on anti-Muslim animus, not on logical and principled position"
Thank you, Mr. Singh, for basically assisting in the dirty work of Mullahs who have already designated Farzana Hassan, Ensaf Haider, Raif Badawi, Raheel Raza and, of course, Dr. Zuhdi Jasser and myself as apostates to Islam deserving of death.